Screenshot of When Calls the Heart via the Hallmark Channel. The Hallmark Channel nailed its recipe for success over a decade ago. In 2003, just two years after the Faith and Values channel rebranded as the Hallmark Channel, the network released an adaptation of Love Comes Softly. The television movie, starring Katherine Heigl and a pre-Mad Men January Jones, was an adaptation of Janette Oke’s 1979 Christian novel and was a precursor to what Hallmark does best. Love Comes Softly was romantic but chaste, faith-centric but not overtly religious, and told the story of women in the American West who were strong and willful but not political (i.e. feminists). It was the definition of family-friendly and became a model for Hallmark’s enduring success. Hallmark followed up on the success of Love Comes Softly by adapting the rest of Oke’s series of eight novels stretched into eleven television movies that generally follow generations of women who all hewed to the already established model. The Hallmark adaptations are much like the books themselves: easy to watch, gauzy, and ultimately reaffirm a traditional iteration of family and family life. They reaffirm, too, the notion of a “simpler time,” set as they are in the 19th century. And, of course, they all star actresses who are accessible and recognizable without being intimidatingly famous (Heigel, Jones, Haylie Duff, and Cheryl Ladd, to name a few). That model has been a goldmine for the Hallmark Channel. According to a report from the Washington Post, the network is booming and “was the only non-news channel in the top 15 to see substantial viewership growth last year.” The network has long appealed to older women (my mom records the hell out of the Hallmark Channel) but has also seen rapid growth “among 18- to 49-year-old women, and a growing number of men are tuning in as well.” While Hallmark has been building its ratings for a decade, the Post notes that the network saw a surge in late 2015, coinciding with the presidential election and Donald Trump’s coarsening of public political debates. Television viewers—particularly women—it seems are tuning into the Hallmark Channel as an escape from politics and news. That ratings surge might be an accidental coincidence but it’s ultimately a payoff for the brand the network has been building since its relaunch in 2001. “We intentionally branded ourselves as the happy place,” Bill Abbott, CEO of Crown Media, told the Post. The current crop of successful shows on Hallmark is a reflection of those values. Take, for example, When Calls the Heart, a period drama now in its fifth season. The show follows Elizabeth Thatcher, a wealthy young woman who leaves material comforts behind to teach in a small Canadian mining town in the early 1900s. The source material is again Janette Oke whose 1983 novel of the same name was, like Love Comes Softly, the first book of a series (the Canada West series). Again, similar themes prevail: the heroine falls in love, deepens her faith, and the values of “simpler times” prevail. While the show, which features Lori Laughlin in a supporting role, is far from buzzy prestige television, it has a deeply dedicated fan base who call themselves Hearties. On social media, the appeal of When Calls the Heart is evident, the show lends itself to swoony crushes and deep involvement in the lives and well-being of the show’s wholesome characters. 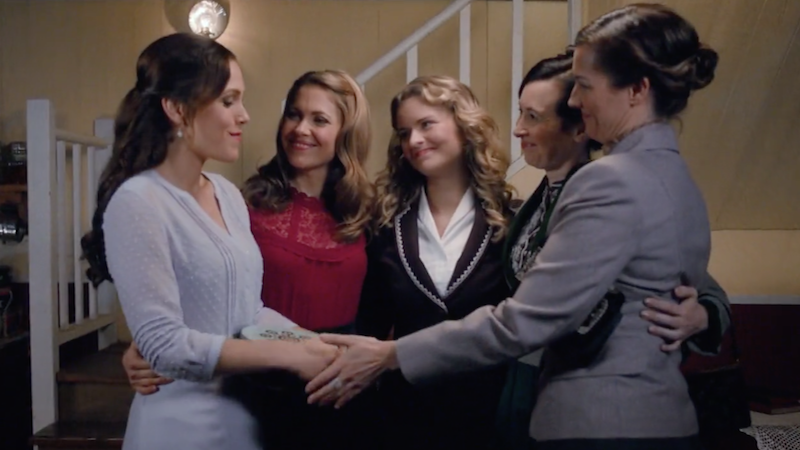 The end of the year is Hallmark’s sweet spot — for viewers and advertising dollars. The channel will start running its Countdown to Christmas on Oct. 27, with 21 original movies that all have a holiday theme. Viewers love it. Hallmark claims more than 85 million people watched one of its channels during November and December last year. Hallmark easily won the ratings race among female viewers during the holidays and was even able to rival powerhouse channels Fox, ESPN and Nickelodeon at times for overall household viewership. Hallmark’s Christmas movies, too, stay true to the network’s brand. They are generally stories of redemption—Christmas miracles of sorts—in which women who struggle with work or family find the Christmas spirit, often in the forms of love or faith (and generally in a small town where car mechanics are mysteriously absent). And again, there are familiar faces in these Hallmark movies, including Andi McDowell, Kristin Davis, and Shirley MacLaine. The Hallmark Channel has built a respectable television empire, one populated by women who are increasingly interested in the traditional values and camp that the very phrase “family-friendly television” conjure up. Hallmark is clearly invested in the viewers and the potential profit they can provide in other genres. The network recently launched Hallmark Movies & Mystery and, in a recent report from an industry journal, Crown Media’s CEO said that the brand will soon launch Hallmark Drama. It’s also launching a digital publishing business that will publish “under the Hallmark publishing banner,” and possibly be turned into movies. “You don’t have to sell it. You don’t have to market it all that much,” Crown Media’s CEO said. “We have great DNA...and we certainly know how to make original content that resonates with a core audience.” While prestige television turns to dragons, zombies, and true crime, Hallmark’s growing audience of women is content to tune into escapist, cozy romances.